We have a very active, exciting, and growing program. We have an exciting new curriculum this year - come check it out! Play ball middle school gang! 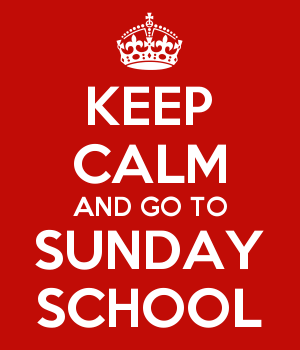 The life and times of a Sunday School teacher…there are misconceptions. Please forgive my ramblings, but I find this topic on my mind these days, so I thought I’d share them with you. I recall a day, years ago, when I was twenty-nine, and visiting this Presbyterian fellowship held at Colby Sawyer College. I had four-year-old Andrea, and two-year-old Alexis, by the hand as we stood in a circle of welcoming women. Polly Wright, Wilma Bastiensen, and Dotty Price were asking me whether I would be interested in teaching Sunday school. At the time, I had all of eight years as a novice teacher under my belt, and a vague, archaic understanding of Bible teachings from my Catholic upbringing. I had not been a regular church-goer since I was thirteen, and did not believe I had the skills, knowledge base, or business molding little minds in any type of theology. Fast forward through the years. I’ve had the opportunity to teach from a variety of curricula, for a variety of age groups, with a variety of fellow teachers who were just like me. As for the teachers – we developed great friendships from the teaching experience. From all that material, I had worked my way to a very basic theological knowledge base – with miles to go before I sleep – or have a thimble full of knowledge that others have. The journey has been amazing. Besides encouraging my own Christian development, I have had an opportunity to work with the people of our future, our kids. The kids are amazing as well! I once heard someone mention that Sunday school for the little kids was nothing more than cut and paste. I’ve heard someone lament they were “afraid” of the middle school kids because the adult didn’t have all the facts, or biblical reference on hand. Some of my best theological conversations have been with five year olds. Kids are a lot more savvy than we think. They don’t want or need to be talked down to – just spoken to in a way that is accessible to them. As for being all knowing – we don’t have to be experts. What a great experience for a child to hear an adult say, “I don’t know – I’m still working that out myself, but let me tell you where I am on that. Or, “I don’t know – let me find out and I’ll let you know next time.” Children are forgiving and understanding. When I was twenty-nine, I did not believe teaching Sunday school, to any age group, was a calling for me. Now, a few years later (right), I realize I was operating under those same misconceptions. I think that God did have that calling in mind for me, for which, as always, hindsight has made me see it - as the gift it was.